Having served the South Bay community for more than 30 years, we are familiar with the look and feel of the homes and businesses in the Gardena neighborhood, as well as the permitting requirements for any new construction in this area. More than anything, we know you expect exceptional work, excellent service and affordable prices. 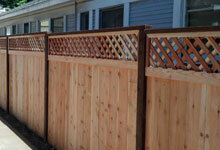 At family owned and operated J&J Fence, we offer our fence expertise and craftsmanship at highly competitive rates. We are passionate about the fencing trade, dedicated to our community and committed to delivering consistently excellent work. We never use subcontractors. With every project we do, we send out our very own fence professionals (each with about 15 years of experience) and make sure that every aspect of the project is overseen by ownership. We are licensed, bonded and insured and offer a 10% discount to new clients. Call today! 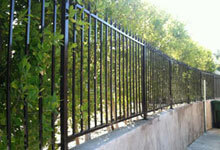 J&J Fence's main specialty is ironwork. From traditional to modern designs, we install hand-forged iron to elevate the look of any home or business in Gardena. We offer ornamental iron, security iron and wrought iron for fencing, gates, fence toppers, fence support, balcony railings, window bars and staircase handrails. Call today to discuss your vision and plans with one of our designers. A wood fence will never go out of style. Whether it is designed to naturally blend in with your garden or landscape or to provide a bold statement of security and privacy, we will custom build your fence using premium redwood or cedar, durable hardware and experienced craftsmanship. We construct beautiful wood picket, stockade, ranch rail and tongue and groove fences, as well as a wide range of custom or combination fences. Call today to schedule an on-site meeting. 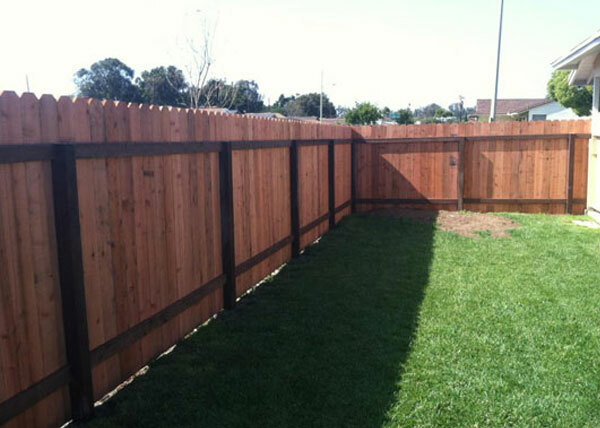 J&J Fence has been installing vinyl fences in Gardena since 1978. Vinyl fences are perfect for those who want to invest in a long-term fence that requires little to no maintenance. 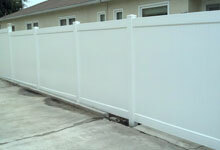 Vinyl can be used to make almost any type of fence and comes with a lifetime warranty. It resists weathering, rot, mold, termites and blistering, and never requires painting. Plus, we offer a wood grain texture option if you want your vinyl fence to resemble a natural wood fence. 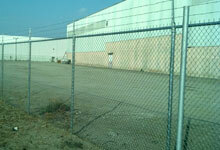 We expertly install chain link for fences, gates, dog kennels, tennis courts and security perimeters in Gardena. These fences can be installed on soft ground or concrete, and modified with extra security features such as locks, security access controls (keypads, swipe cards, etc. ), electrical operators, privacy slats, razor wire and barbed wire. Chain link (also called cyclone fencing) is a great option for those wanting an affordable, long lasting, low maintenance fence.